Windsor ( /ˈwɪnzər/) is a historic market town and unparished area in the Royal Borough of Windsor and Maidenhead in Berkshire, England. It is widely known as the site of Windsor Castle, one of the official residences of the British Royal Family. The town is situated 23 miles (37 km) west of Charing Cross, London, 7 miles (11 km) south east of Maidenhead, and 21 miles (34 km) east of Reading. It is immediately south of the River Thames, which forms its boundary with its ancient twin town of Eton. The village of Old Windsor, just over 2 miles (3 km) to the south, predates what is now called Windsor by around 300 years; in the past Windsor was formally referred to as New Windsor to distinguish the two. The early history of the site is unknown, although it was almost certainly settled some years before 1070 when William the Conqueror had a timber motte and bailey castle constructed. The focus of royal interest at that time was not the castle, however, but a small riverside settlement about 3 miles (5 km) downstream, possibly established from the 7th century. Windsor, or Windlesora as it was called in the 11th century, is first mentioned in the Anglo-Saxon Chronicle. The name originates from old English Windles-ore, or 'winch by the riverside'. The settlement had used an earlier name, but this is unknown. From about the 8th century, high status people started to visit the site occasionally, and possibly this included royalty. From the 11th century the site's link with king Edward the Confessor is documented, but again, information about his use of the place is scant. After the Conquest of 1066 royal use of the site increased, probably because it offered good access to woodlands and opportunities for hunting – a sport which also practised military skills. By the late 12th century, and the relocation of the royal household to an enlarged castle in 1110, the site was renamed Old Windsor. Windsor Castle is noted in the Domesday Book under the entry for Clewer, the neighbouring manor to Windsor. Although this might seem strange, it occurred because plans for the castle had changed since 1070, and more land had been acquired in Clewer on which to site a castle town. This plan was not actioned until the early 12th century. By 1110, meetings of the Great Council, which had previously taken place at Windlesora, were noted as taking place at the Castle – referred to as New Windsor, probably to indicate that it was a two ward castle/borough complex, similar to other early castle designs, such as Denbigh. Henry I – according to one chronicle – had rebuilt it, and this followed the Norman kings' actions at other royal sites, such as Westminster, where larger and more magnificent accommodation was thought necessary for the new dynasty. King Henry married his second wife at Windsor Castle in 1121, after the White Ship disaster. The settlement at Old Windsor largely transferred to New Windsor during the 12th century, although substantial planning and setting out of the new town (including the parish church, marketplace, bridge, hermitage and leper hospital) did not take place until c. 1170, under Henry II, following the civil war of Stephen's reign. At about the same time, the present upper ward of the castle was rebuilt in stone. Windsor Bridge is the earliest bridge on the Thames between Staines and Reading, built at a time when bridge building was rare; it was first documented in 1191, but had probably been built, according to the Pipe rolls, in 1173. It played an important part in the national road system, linking London with Reading and Winchester, but also, by diverting traffic into the new town, it underpinned the success of its fledgling economy. The town of New Windsor, as an ancient demesne of the Crown, was a privileged settlement from the start, apparently having the rights of a 'free borough', for which other towns had to pay substantial fees to the king. It had a merchant guild (known by the 14th century as the Fraternity or brotherhood of the Holy Trinity) from the early 13th century and, under royal patronage, was made the chief town of the county in 1277, as part of its grant of royal borough status by Edward I's charter. Somewhat unusually, this charter gave no new rights or privileges to Windsor but probably codified the rights which it had enjoyed for many years. Windsor's position as chief town of Berkshire was short-lived, however, as people found it difficult to reach. Wallingford took over this position in the early 14th century. As a self-governing town Windsor enjoyed a number of freedoms unavailable to other towns, including the right to hold its own borough court, the right of membership (or 'freedom') and some financial independence. The town accounts of the 16th century survive in part, although most of the once substantial borough archive dating back to the 12th century was destroyed, probably in the late 17th century. The Last Supper by Franz de Cleyn in the West Gallery of Windsor parish church of St John The Baptist. New Windsor was a nationally significant town in the Middle Ages, certainly one of the fifty wealthiest towns in the country by 1332. Its prosperity came from its close association with the royal household. The repeated investment in the castle brought London merchants (goldsmiths, vintners, spicers and mercers) to the town in the late 13th century and provided much employment for townsmen. The development of the castle under Edward III, between 1350–68, was the largest secular building project in England of the Middle Ages, and many Windsor people worked on this project, again bringing great wealth to the town. Although the Black Death in 1348 had reduced some towns' populations by up to 50%, in Windsor the building projects of Edward III brought money to the town, and possibly its population doubled: this was a 'boom' time for the local economy. People came to the town from every part of the country, and from continental Europe. The poet Geoffrey Chaucer held the honorific post of 'Clerk of the Works' at Windsor Castle in 1391. The development of the castle continued in the late 15th century with the rebuilding of St George's Chapel. With this Windsor became a major pilgrimage destination, particularly for Londoners. Pilgrims came to touch the royal shrine of the murdered Henry VI, the fragment of the True Cross and other important relics. Visits to the chapel were probably combined with a visit to the important nearby Marian shrine and college at Eton, founded by Henry VI in 1440, and dedicated to the Assumption; which is now better known as Eton College. Pilgrims came with substantial sums to spend. From perhaps two or three named inns in the late 15th century, some 30 can be identified a century later. The town again grew in wealth. For London pilgrims, Windsor was probably – but briefly – of greater importance than Canterbury and the shrine of the City's patron Saint Thomas Becket. With the closures of the Reformation, however, Windsor's pilgrim traffic died out. Henry VIII was buried in St George's Chapel in 1547, next to Jane Seymour, the mother of his only legitimate son, Edward (Edward VI). Henry, the founder of the Church of England, may have wanted to benefit from the stream of pilgrims coming to the town. His will gives that impression. The town began to stagnate about ten years after the Reformation. The castle was considered old-fashioned and shrines to the dead were thought to be superstitious. The early modern period formed a stark contrast to the medieval history of the town. Most accounts of Windsor in the 16th and 17th centuries talk of its poverty, badly made streets and poor housing. Shakespeare's play The Merry Wives of Windsor is set in Windsor and contains many references to parts of the town and the surrounding countryside. Shakespeare must have walked the town's streets, near the castle and river, much as people still do. The play may have been written in the Garter Inn, opposite the Castle, but this was destroyed by fire in the late 17th century. The long-standing – and famous – courtesan of king Charles II, Nell Gwyn, was given a house on St Albans Street: Burford House (now part of the Royal Mews). Her residence in this house, as far as it is possible to tell, was brief. Only one of her letters addressed from Burford House survives: it was probably intended as a legacy for her illegitimate son, the Earl of Burford, later the Duke of St Albans. Windsor was garrisoned by Colonel Venn during the English Civil War. Later it became the home of the New Model Army when Venn had left the castle in 1645. Despite its royal dependence, like many commercial centres, Windsor was a Parliamentarian town. Charles I was buried without ceremony in St George's Chapel after his execution at Whitehall in 1649. The present Guildhall, built in 1680–91, replaced an earlier market house that had been built on the same site around 1580, as well as the old guildhall, which faced the castle and had been built around 1350. The contraction in the number of old public buildings speaks of a town 'clearing the decks', ready for a renewed period of prosperity with Charles II's return to the Castle. But his successors did not use the place, and as the town was short of money, the planned new civic buildings did not appear. The town continued in poverty until the mid 19th century. In 1652 the largest house in Windsor Great Park was built on land which Oliver Cromwell had appropriated from the Crown. Now known as Cumberland Lodge after the Duke of Cumberland's residence there in the mid 18th century, the house was variously known as Byfield House, New Lodge, Ranger's Lodge, Windsor Lodge and Great Lodge. In 1778, there was a resumption of the royal presence, with George III at the Queen's Lodge and, from 1804, at the castle. This started a period of new development in Windsor, with the building of two army barracks. However the associated large numbers of soldiers led to a major prostitution problem by 1830, in a town where the number of streets had little changed since 1530. In the 18th c. the town traded with London selling the Windsor Chair which was actually made in Buckinghamshire. A number of fine houses were built in this period, including Hadleigh House on Sheet Street, which was built in 1793 by the then Mayor of Windsor, William Thomas. In 1811 it was the home of John O'Reilly, the apothecary-surgeon to George III. Windsor Castle was the westernmost sighting-point for the Anglo-French Survey (1784–1790), which measured the precise distance between the Royal Greenwich Observatory and the Paris Observatory by trigonometry. Windsor was used because of its relative proximity to the base-line of the survey at Hounslow Heath. The substantial redevelopment of the castle in the subsequent decade and Queen Victoria's residence from 1840, as well as the coming of two railways in 1849, signalled the most dramatic changes in the town's history. These events catapulted the town from a sleepy medieval has-been to the centre of empire – many European crowned heads of state came to Windsor to visit the Queen throughout the rest of the 19th century. Unfortunately, excessive redevelopment and 'refurbishment' of Windsor's medieval fabric at this time resulted in widespread destruction of the old town, including the demolition of the old parish church of St John the Baptist in 1820. The original had been built around 1135. Most of the current town's streets date from the mid to late 19th century. However the main street, Peascod Street (pronunciation: /ˈpɛskɒd/) is very ancient, predating the castle by many years, and probably of Saxon origin. It formed part of the 10th-century parish structure in east Berkshire and is first referred to as Peascroftstret in c. 1170. The 1000-year-old royal Castle, although the largest and longest-occupied in Europe, is a recent development in comparison. "New Windsor" was officially renamed "Windsor" in 1974. The parish church of All Saints' is situated on Frances Road. The incumbent vicar is the Revd Ainsley Swift. The author Thomas Hardy trained as an architect and joined Arthur Blomfield's practice as assistant architect in April 1862. Between 1862 and 1864 he worked with Blomfield on All Saints'. A reredos, possibly designed by Hardy, was discovered behind panelling at All Saints' in August 2016. As a result of the castle, Windsor is a popular tourist destination and has facilities usually found in larger towns: two railway stations, a theatre and several substantial hotels. Various boat trips operate on the River Thames, with connections to Maidenhead and Staines-upon-Thames. In winter, Alexandra Gardens hosts a temporary ice rink. Near the town is Legoland Windsor, the only Legoland park in the United Kingdom and the largest Legoland park in the world in terms of area. Legoland Windsor was built on the site of the former Windsor Safari Park. As a tourist town there are many gift shops around the castle, together with stylish shops and restaurants in Windsor Royal Shopping inside Windsor & Eton Central railway station. The main shopping street, Peascod Street, includes as an independent department store, W J Daniel & Co., noted for its large toy department, as well as national chains such as Marks & Spencer and Boots. King Edward Court, a pedestrian-only shopping centre, has a Waitrose supermarket alongside other stores including H&M, New Look and Zara. Windsor is accessible from Junction 6 of the M4 and from Slough via a 3 mile long dual carriageway. Bus services in the town are mostly provided by First Berkshire & The Thames Valley, although a park-and-ride service and one local route are operated by Courtney Coaches. Windsor has two railway stations. Windsor & Eton Central railway station has a shuttle service to Slough. Windsor & Eton Riverside station provides a service to London Waterloo. Both stations were built at around the same time in the 19th century, as the two train companies which owned the lines both wanted to carry Queen Victoria to Windsor, with the first line opened gaining the privilege. From 1883 to 1885, the London Underground's District line's westbound service ran as far as Windsor. Windsor has frequent bus services to/from London Heathrow Airport, Victoria Coach Station in central London and Legoland Windsor Resort. Windsor is linked to the town of Eton (on the opposite bank of the River Thames) by Windsor Bridge. Originally a fully trafficked road bridge, Windsor Bridge is now for pedestrians and cyclists only. To the south of the town lies Windsor Great Park and the towns of Old Windsor, Egham and Virginia Water. Windsor lies on National Cycle Route 4 (London – St David's). The main access roads serving the town have adjacent cycle paths or nearby alternative traffic-free cycle routes. As well as HM Queen Elizabeth II and other British Royal Family members, Windsor has many other notable residents both former and current. Comedian Billy Connelly lived in Windsor for several years in the 1990s. Actress Anna Friel spent several years living in Windsor, but moved away in 2007. Australian pop singer Natalie Imbruglia owns a house on White Lilies Island in the Clewer village area of Windsor. New Zealand motorcycle racer Bruce Anstey has a home in Windsor, and spends some of his time there with his partner, Anny. Actor Michael Caine lived at the Old Mill House at the end of Mill Lane, Windsor during the 1960s and 1970s. The house was subsequently sold to guitarist Jimmy Page, of the rock band Led Zeppelin, who sold the property in 2004. Jazz musician and orchestra leader on the Simon Dee Show, Maynard Ferguson, along with his wife Flo and 4 children; Corberly, Lisa, Bentley and Wilder, lived next door to Michael Caine in the late 60's and early 1970's. Actor Kris Marshall used to live in the Clewer area from 2000 to 2009. Dhani Harrison, musician and son of George Harrison, was born in Windsor. Circus Founder Sir Billy Smart Sr. was born in Windsor and owned much of North Street, Winkfield, where he had his circus winter quarters. Circus Co-Owner Billy Smart Jr. lived in St. Leonard's Mansion in heart of Windsor Safari Park, where he entertained celebrated persons from Princess Margaret to The Beatles. Also sold his St. Leonard's Hill guest house to comedian Freddie Starr and later lived in Ascot Place, which is now apartments and has a plaque and statue dedicated to Billy Smart Jr.
Comedian Freddie Starr lived in Windsor in the 1970s in the St Leonard's Hill area.. Pop star Lisa Scott-Lee, formerly of the teen band Steps and now a solo performer. Margaret Oliphant, 19th century novelist and historical writer, lived at Clarence Crescent. Today the house is named "Oliphant House". Ranulph Fiennes, adventurer, explorer and author was born in Windsor. Actress Sue Holderness who played Marlene in the long running UK TV sit-coms Only Fools and Horses and The Green Green Grass. Sir Sydney Camm, designer of the World War II fighter aircraft the Hawker Hurricane, lived at 10 Alma Road. A memorial in the form of a replica Hawker Hurricane is displayed near Baths Island, close to where the Slough to Windsor & Eton railway line crosses the River Thames. Zinzan Brooke, New Zealand rugby union international, who formerly played amateur rugby for Windsor Rugby Football Club. Hugh Thomas, historian, was born in Windsor. Windsor's senior football team is Windsor F.C. The team currently play in the Combined Counties League Premier Division and their home is Stag Meadow, granted to the original club by King George VI in 1911. The ground, in Windsor Great Park, is one of the most iconic football locations in the UK. The club's president is the famous BBC commentator Barry Davies. Windsor Cricket Club's clubhouse and pitches are at Home Park in the shadow of Windsor Castle. The club played host to a 2006 Lord's Taverners cricket match. The Windsor 1st team currently play in Division 2A of the Thames Valley League. Neighbours, Windsor Rugby Club also use the ground and the team currently plays in the Southern Counties – South Division. Several other local sports clubs are based at Home Park, including: Hockey and archery clubs, and the Datchet Dashers running club. Royal Windsor Rollergirls, were one of the first roller derby leagues to be founded in the UK in 2007, they regularly hold games at Windsor Leisure Centre. For more details on this topic, see Windsor (UK Parliament constituency). Windsor is part of the Royal Borough of Windsor and Maidenhead which is administered by an elected unitary authority. The mayor is Cllr Sayonara Luxton (Conservative). The current Member of Parliament for the Windsor constituency (which includes surrounding small towns and villages, such as Eton and Datchet) is Adam Afriyie (Conservative), who was elected at the 2005 General Election. Afriyie is notable for being the first black Conservative in the House of Commons. In 2012 the council reintroduced the role of town crier to the Borough. The previous town crier had retired in 1892 and for 110 years the post remained vacant. Parts of Charlie Higson's horror novel, The Enemy #6: The Hunted (2014) are set at Legoland, Windsor, which Ella and Face-Ache first enter at the end of chapter 6. In chapter 7, Ella compares and contrasts her experiences there before and after the apocalypse, and given the current state of the park and the danger posed by the infected "parents" there, she calls the establishment "Zombieland". ^ Local government legislation in the 1970s referred to the borough as "New Windsor"
^ "The Parish Church of St. John The Baptist, Windsor. A History". Thamesweb.co.uk. 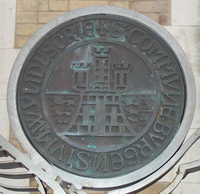 http://www.thamesweb.co.uk/parishchurch/parishchrch.html. Retrieved 3 February 2012. ^ Cumberland Lodge: A History Archived November 21, 2011 at the Wayback Machine. ^ Flood, Alison (16 August 2016). "Thomas Hardy altarpiece discovered in Windsor church". The Guardian. https://www.theguardian.com/books/2016/aug/16/thomas-hardy-altarpiece-discovered-in-windsor-church. Retrieved 17 August 2016. ^ Windsor On Ice 2012 | Home. Windsoronice.com. Retrieved on 17 July 2013. ^ "The Railways at Windsor - The Royal Windsor Web Site History Zone". http://www.thamesweb.co.uk/windsor/windsorhistory/railways/railway.html. Retrieved 2015-05-31. ^ Windsor and Maidenhead Town Crier Town Crier Windsor and Maidenhead – Chris Brown. Windsortowncrier.com. Retrieved on 17 July 2013. This page uses content from the English language Wikipedia. The original content was at Windsor, Berkshire. The list of authors can be seen in the page history. As with this Familypedia wiki, the content of Wikipedia is available under the Creative Commons License.